Has anyone done an Add a Leaf to the front of their M37. My springs are almost straight after swapping in a 318. It will cost about $350 for re-arching and adding a leaf by a shop not to mention having to pull them and take them about 100 miles to the shop. Mine are as well on my V-8 Powered M. Not been an issue though, provides a nicer ride that way. Could I ask what brand did you use? My front springs are NOS. Adding a leaf or two is a common part of the restoration of these trucks, as well as for the civilian PW. My springs were flat on my '52 Power Wagon. I took the cleaned spring pack to a spring shop and the mechanic there told me that they can re-arch them to specs, but to "hold" the spec you need to add a leaf - another modern steel spring leaf - which I had them do. Now, 6 years later, the springs look normal; the shackle is almost vertical, only slightly tipped forward. Adding more weight is another reason to add leaves. I am doing a restomod on an M37 now. I am installing a diesel engine and these are a lot heavier than the flathead. I also will have the winch. I am planning on having the spring shop add at least two or possibly 3 leaves to a NOS pack that I bought. BTW, the factory spec for the front spring arch in these trucks is 5.25". This is important to tell the spring shop too. I will be adding 4 to my front pack this week. in prep for a 4BT swap in the fall. I got 2 used rear spring packs for $30 off a local guy on craigslist. took them apart cleaned up what I needed. will be making the shackles and all myself, pretty easy fab job. I bought New centerpins and had new longer ubolts made up also. Im looking to get 3" of height over what I have now. It rides like a caddilac now, if it stiffens it up it wont disapoint me. Thanks for all the input. The one thing I was wondering if someone had added leafs themself. I know you can buy them. Or is this something that you don't think is a wise thing to do on your own. The spring shop added the leaf for me. Then they made sure the arch was correct, and bent it accordingly. i believe you would be better off letting a pro do this for you. my dad and I used to break a lot of springs getting firewood with his chevy, he always kept some spares. an easy way to add a leaf is to put 2 C clamps on the leaf pack left and right. above where you want to add your leaf. then take the ubolts off. jack the truck up off the axle housing. take the bolt out of the center of the leaf pack. add you leaf/leafs. put bolt back in center set truck back down and reinstall u bolts. it's easy because you don't have to fight with getting the shakle bolts out. 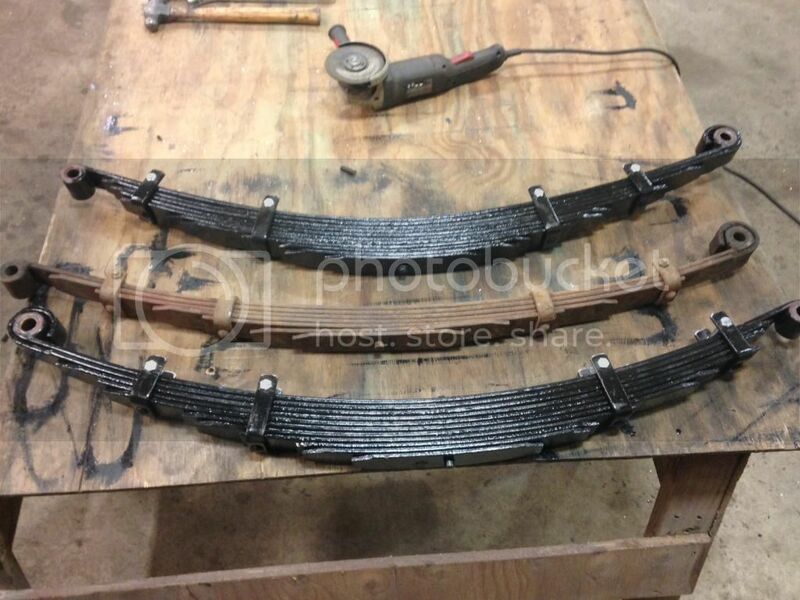 here is my rear leaf springs off my m37 from when I bought the truck. they were beyond a couple c clamps and adding a leaf. but you can see the bolt that goes up through the center of the leaf pack that I am talking about. not to highjack the thread but where the craigs list springs m37? I remember mine being an oddball width that I couldn't find any of at the junkyard. I would like to add some to the front and totally agree about how soft they are. Yes they were takeout M37 leaf spring packs, they are 2" wide. Is the 5.25” spring arch the same, front and back, for a 48’ Power Wagon?